They say I’ll never swim in the ocean. They say I’ll never sing on the moon. Don’t tell me, how it’s got to be. The possibilities. The possibilities. Last Fall, I was eating lunch with Turner and our friend, Joe Stevenson, the Executive Director of 12 Bands. Joe was sharing how much he was enjoying a creative songwriting phase in his life, and I mentioned how much I would love to write a song about childhood cancer which focused on the possibilities instead of the inevitabilities. I am and continue to be inspired by what the human spirit can accomplish when told, “you can’t.” Don’t get me wrong. I am a realist, but I am also a believer in the possibilities. If there is even the slightest possibility that something may be accomplished, some barrier may be pushed, some new ground broken, then I believe there is value in the effort of reaching for that possibility. If it turns out that specific dream cannot be realized in the end, I will examine the circumstances from another perspective. Perhaps, a dream actually was realized in each and every step taken toward the ultimate goal. The magic, after all, happens in the believing in the dream and the inspired action taken toward achieving the dream. 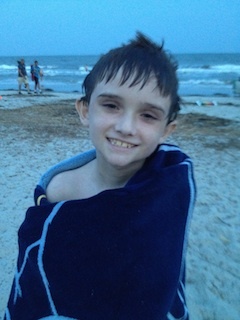 Over the 4th of July, I had the distinct joy of witnessing their words come to life as Brennan swam in the Atlantic Ocean for the first time in 4 years! It was dusk. The sky was colored with the brilliance of the setting sun reflecting on the clouds – the perfect time of day for such a sweet moment filled with all the humility and triumph this life has to offer. As Brennan was diving into the ocean, I pictured him diving into the Sea of God’s Love, and I thought about his personal victory in this experience, and as I always do when I think about Brennan experiencing a long awaited for moment, I think about all of our beautiful, precious friends who are not here to dive into the ocean with him; however, I have learned not to run from that flood of feelings anymore. So, I stood there on the beach and allowed the entire spectrum of feelings to wash over me as the sun dipped lower into the Sea. Eventually, Brennan ran out of the ocean and straight for me – his smiling face breaking my trance. I asked him what the ocean water felt like. He remarked, in what has become his trademarked stoicism, “It was great. You know, Mommie, I forgot what it felt like to float in the ocean. The water really holds you up.” And there it was. The gift. The tying it all together. He was floating in the Sea of God’s Love supported by the love of all those beautiful, precious souls who weren’t diving in the ocean anymore, but who were as much a part of the ocean as they ever were. Thus, we keep pushing the envelope and sharing the possibilities with each other, with the next family, the next child. It is this commitment to Press On in the face of those who say you can’t cure childhood cancer in your lifetime and to make possible for others those treatments which Patrick and Brennan had the courage to accept and endure in the hope of the promise of another opportunity to swim in the ocean that I am most proud. The recent Press On grant to CHOA for the MIBG room at Children’s Healthcare of Atlanta will provide children all over the Southeast with the possibility of the promise this treatment holds. It was Patrick’s courage to try this treatment that convinced us that it works. Thus, Patrick continues to support us as we push toward the ultimate goal of realizing a cure in our lifetime. There is value in this. Thank you for seeing it. It is your generosity that made this gift a possibility. Now that Brennan has taken his swim in the ocean, I suppose it is time to set our sights on singing on the moon. I hope you will join us. We have lots of work to do. Let’s give it a try. Together. Absolutely, the most important factor that is elaborate while purchasing medicaments from the Web is to make a best choice. To purchase medicaments online from a privileged web-site is safe. Other medicaments are used to treat complaints such as hair loss. What about buy propecia online and alopecia? Very likely every adult has heard about buy propecia. (Read more finasteride online). A extended medical condition present is hair loss. What medicine does treat alopecia? Most of patients using this physic mostly do not have any side effects to Finasteride. Even if this preparation is not for use in women, it is not known whether this generic could harm a nursing baby. You inspire us, more than you can imagine. Much love and continued Hope! Tara…your words are beautiful and inspiring. A great way to start my day! Press on! That’s the young man that helped inspire my business from afar. Brennan, you’re my hero. And that photo is fitting… wrapped in a cape. For how long has your name crossed my lips in daily prayer? Two years? I have forgotten…. Tomorrow I will have surgery to repair a torn tendon in my right arm. In the last few days when I felt afraid of the unknown, I reminded myself of what a small thing I am facing compared to what you and your family have been through. Today, this little piece of your victory – this story of you swimming in the ocean – arrived in my box. Another gift from Brennan. Another way that your life blesses mine. It’s a wonderful thing – the way that prayer wraps around the souls of both the one who prays, and the one for whom prayers are lifted. Swim strong, Brennan! Sing on the moon!